Burdekin's basket maker's made industrial skips and baskets for the woollen trade and other sundry items for the domestic market such as pigeon baskets, shopping baskets and wicker furniture. The Burdekin family lived in a large house in Flushdyke near to Nettleton & Porter's works. When the founder of the business, Joe Burdekin died, his two sons carried on the business and significantly expanded it. 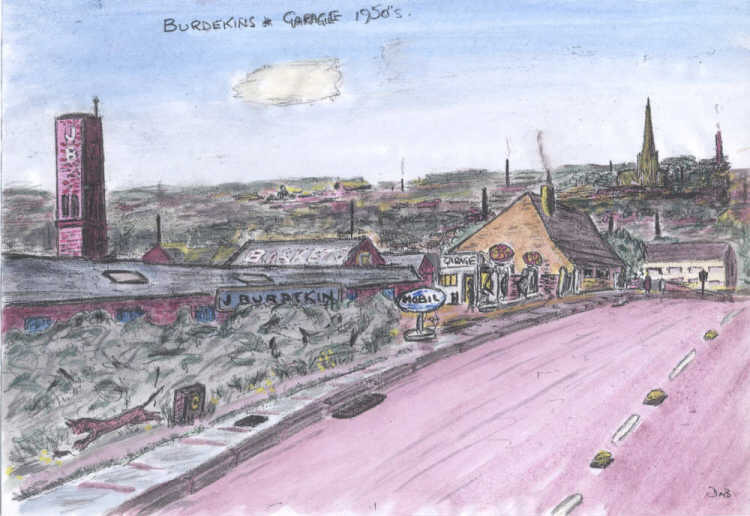 A garage also operated from what is now the forecourt to the Burdekin showroom. The house behind the garage belonged to a farmer who was also a milkman, but was eventually sold and redeveloped by Edwin Guy, a nephew of Sam Bickle. Below the house was a rag mill, which was demolished and a bungalow was built in its place. In the background, you can see the plethora of mill chimneys that punctuated the Ossett skyline in the early part of the 20th century. Ossett was a grimy, smoke stained town before the mills and their chimneys disappeared.